KUALA LUMPUR (Feb 19): Why did SRC International, a Finance Ministry-owned subsidiary, transfer millions of ringgit into the personal accounts of Prime Minister Datuk Seri Najib Razak, who is also the finance minister? Did SRC International commit any criminal offence by transferring the funds into Najib’s accounts? Attorney-General (A-G) Tan Sri Mohamed Apandi Ali said last month Najib did not commit any criminal offence because he was unaware from where the money came. At the date of its incorporation, the board of directors comprised Datuk Che Abdullah @ Rashidi Che Omar, Datuk Suboh Md Yassin, Datuk Paduka Ismee Ismail, Nik Faisal Ariff Kamil, Vincent Beng Huat Koh and Datuk Shahrol Azral Ibrahim Halmi. The identity of the current top management team is unknown, as Faisal and Suboh, both of whom served as the company directors, disappeared last year amid MACC’s investigations into the firm. SRC International was formerly a subsidiary of 1Malaysia Development Bhd (1MDB), but ties were severed in February 2012 in order to qualify for a RM4 billion loan from the Retirement Fund Incorporated (KWAP). The loan, which was disbursed in two tranches in Aug 2011 and March 2012, was spent on investments in Indonesia, Mongolia and “some other countries”, the ministry said last year. Despite the controversy surrounding SRC International, the company appears to keep a low profile. Its website, src.com.my, contains only the company logo, name and the message: “Thank you for your visit. Please note that our site is currently under construction”. Even more mysterious, src.com.my only turns up as the 31st search result during a search for “SRC International Sdn Bhd” on Google. Unlike its former parent company, SRC International has had little engagement with the press and the public. It has issued only two press statements to date: on Oct 21 and Nov 5, 2015. Both were bare denials that its RM4 billion loan from KWAP was misappropriated. The public first heard about SRC International when The Wall Street Journal (WSJ) reported last year that money flowed from the company into Najib’s accounts. Between December 2014 and February 2015, SRC International transferred RM50 million to its subsidiary, Gandingan Mentari, which transferred the RM50 million to Ihsan Perdana, WSJ reported. Ihsan Perdana was a private company set up to undertake corporate social responsibility (CSR) programmes for 1MDB. From Ihsan Perdana, RM42 million was transferred into Najib’s accounts at AmBank in three deposits of RM27 million, RM5 million and RM10 million, said WSJ. But according to several documents the A-G showed in a press conference last month, SRC International transferred another RM35 million to Putra Perdana Construction. That firm, in turn, transferred RM34.99 million to Permai Binaraya, which transferred RM27 million to a private bank account ending in “880”. Funds transferred to the “880” account were used to pay for Najib’s Visa and MasterCard bills amounting to a total of RM3.2 million, according to Apandi’s charts. SRC International also transferred RM105 million and RM30 million on July 14, 2014 and Aug 8 the same year to Putra Perdana Construction. Apandi did not explain why SRC International, a company dealing in energy, was transferring money to a construction outfit. Nor did he explain why some of the money ended up in an account which settled Najib’s credit cards. The Malaysian Insider emailed SRC International for an explanation on the money transfer, and the nature of its business with Putra Perdana Construction, but has yet to receive a response. Police have also yet to respond to The Malaysian Insider’s questions on whether or not they were investigating a possible case of criminal breach of trust by SRC International. MACC is unable to reveal any details of its probe into SRC International to the public as it is bound by the MACC Act 2009. Its Operations Review Panel and the Special Panel were to meet with Apandi yesterday to obtain a clarification on his order to close investigations into SRC International. But the meeting was cancelled at the eleventh hour, without any explanation. Barisan Nasional strategic communications chief Datuk Abdul Rahman Dahlan and Umno information chief Tan Sri Annuar Musa also did not respond to The Malaysian Insider’s requests for comments. But DAP lawmaker Tony Pua told The Malaysian Insider he had submitted to Parliament a question on why SRC International had transferred the funds to Putra Perdana Construction. Pua previously told a press conference that given the number of transactions involved, and the instant utilisation of the funds upon receipt, it was “incredible” for the A-G to accept at face value Najib’s claim he did not know the money originated from SRC International. “In fact, Apandi dug the grave for the prime minister by claiming that the latter thought the funds were from the mysterious Arab donor, who gifted him with US$681 million. “However, Najib would have contradicted himself because the unutilised Arab donation was purportedly returned to the donor in August 2013, long before the SRC International transfers took place. 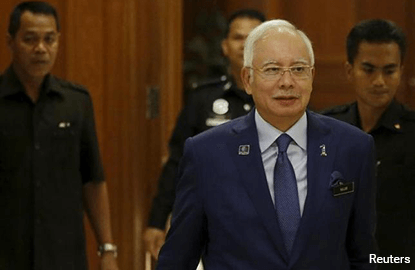 “Based on this evidence alone, there is now a prima facie case to charge the prime minister with corruption or criminal breach of trust, and it is for Najib to prove his innocence in the court of law,” Pua said. Pua said Apandi would be abusing his discretionary powers accepting Najib’s unconvincing and contradictory excuses by not allowing the court to determine the truth.